Born in the Netherlands, Otto Tausk is an exciting artist and respected conductor on the world stage who has put together an impressive career, appearing with the Los Angeles Philharmonic’s ‘Green Umbrella’ Series, Concertgebouw Orchestra, Rotterdam Philharmonic, Danish National Symphony Orchestra, and the radio orchestras of the BBC in the UK. Known as a collaborator of the highest order, he is widely respected for his extensive knowledge and orchestral prowess, achieving critical acclaim in Europe. 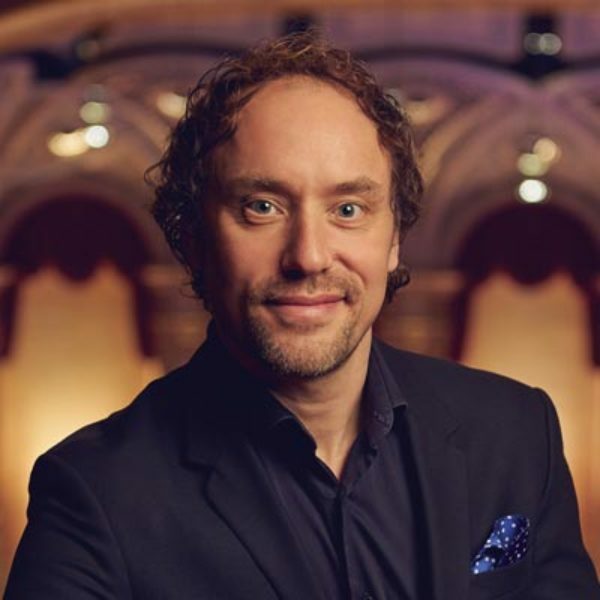 Dutch conductor Otto Tausk is the incoming Music Director of the Vancouver Symphony Orchestra from 2018/2019, where the arrival of his infectiously energetic talent is keenly anticipated. He also serves as Artistic Advisor of the VSO School of Music. Until spring 2018, Tausk was Music Director of the Opera Theatre and Tonhalle orchestra St Gallen, Switzerland. He appears as a guest conductor with such orchestras as Concertgebouw Orchestra, Rotterdam Philharmonic, Danish National Symphony Orchestra, Orchestra Sinfonica di Milano Giuseppe Verdi, Los Angeles Philharmonic, Melbourne Symphony, the Orchestra of the Mariinsky Theatre, the orchestras of Perth, Tasmania, Auckland and the BBC National Orchestra of Wales and BBC Scottish symphonies. He is a hugely respected musical personality in his native Holland, working with all its major orchestras and composers. The 2018/2019 season begins with Tausk’s London concert debut at the BBC Proms, conducting the BBC National Orchestra of Wales. He furthermore continues guest relationships with the National Orchestra of Belgium, Netherlands Radio Philharmonic and Dutch National Opera, and makes debut performances with New Jersey Symphony and Orquesta de Valencia. In the opera pit in St Gallen, Tausk has recently conducted the world premiere of Anna Maske, by Swiss composer David Philip Hefti, the Swiss premiere of George Benjamin’s Written on Skin, Korngold’s Die Tote Stadt, and other titles including Don Giovanni, Die Entführung aus dem Serail, Eugene Onegin, West Side Story, Lohengrin, and Ariadne auf Naxos. In Vancouver he has programmes planned in the current season with soloists such as James Ehnes, Renée Fleming, the Jussen Brothers and Itzhak Perlman, to name a few. Otto Tausk has recorded with the Concertgebouw Orchestra (Luc Brewaeys, and an animated version of Prokofiev’s Peter and the Wolf), Tonhalle Orchestra St Gallen (Korngold and Diepenbrock), BBC Scottish (Mendelssohn) and the Netherlands Radio Philharmonic Orchestra (Gavin Bryars) amongst others. For the cpo label in 2011 Hans Pfitzner’s enchanting Orchesterlieder garnered international praise, not least the Classica France’s “Choc du mois”. His Prokofiev disc with Rosanne Philippens also received BBC Music Magazine Concerto Disc of the Month ( January 2018). Born in Utrecht, Otto Tausk studied violin and then conducting with Jonas Aleksa. Between 2004 – 2006, Tausk was assistant conductor to Valery Gergiev with the Rotterdam Philharmonic, a period of study that had a profound impact on him. In 2011 Otto Tausk was presented with the ‘de Olifant’ prize by the City of Haarlem. He received this prestigious award for his contribution to the Arts in the Netherlands, in particular his extensive work with Holland Symfonia serving as Music Director 2007 to 2012. In reflecting on their work together in The Netherlands, Valery Gergiev paid particular tribute to Tausk on this occasion.